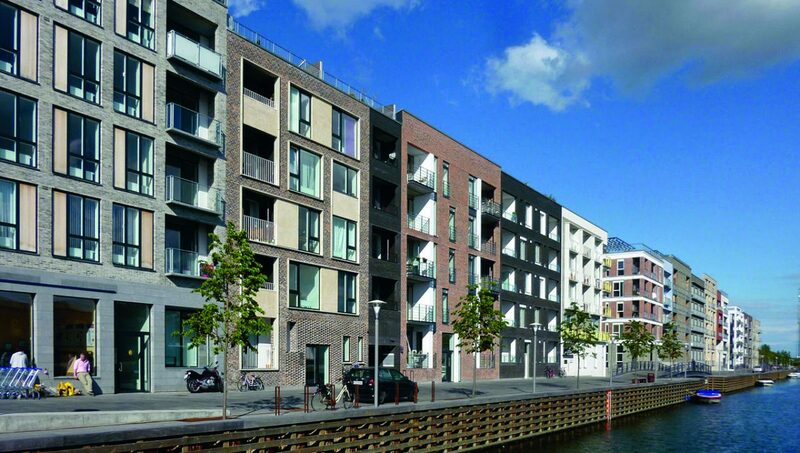 Copenhagen is a dense and growing Scandinavian city with a demand for well-designed, environmentally friendly housing in close proximity to the city centre. 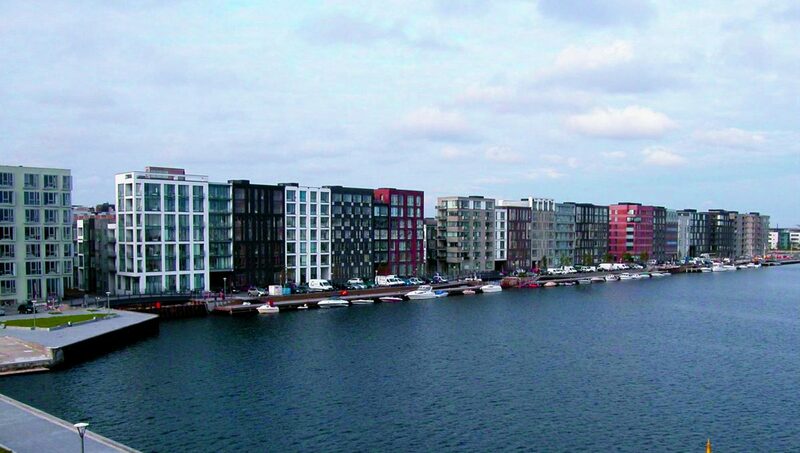 The Sluseholmen industrial area in the south harbour of Copenhagen had been in decline and absent of commercial use for decades when the municipality and the harbour corporation started a dialogue about renewing the area in 1999. The partner organizations had a vision of creating a new, liveable, mixed-use neighbourhood on this prime waterfront real estate. Several challenges arose from the beginning. The industrial land use of the site was toxic and needed major environmental mitigation before people could safely live there. Water systems were another major challenge to tackle. 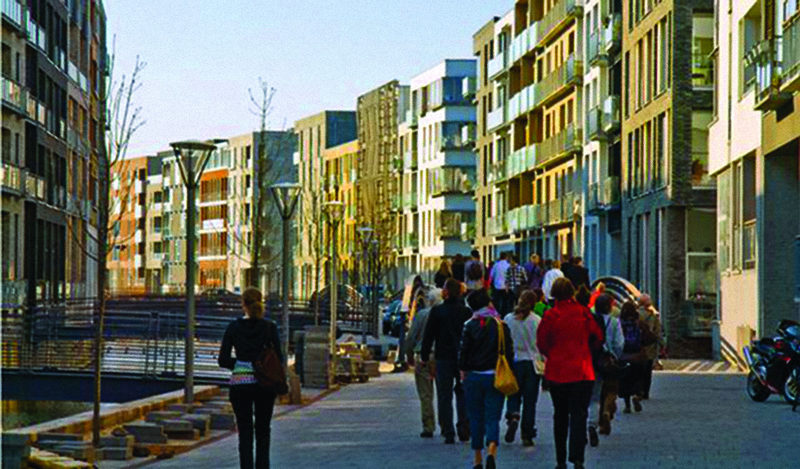 Another issue was how to construct an entirely new neighbourhood with architecture and urban design that maintains diversity, exhibits progressive Danish design, and preserves the walking and cycling culture of the Danes. With inspiration from Amsterdam’s IJburg development, the redevelopment team created a mixed-use neighbourhood based on a canal system that forms eight small islands. Each block and home are different from one another, yet all together they form a cohesive collection—and of course each building group has their own protected courtyard, in true Danish style. About 25 Danish architecture firms contributed to the façade variety. The ground level of the neighbourhood is already lively, and is outfitted for future flexibility. With the help of a project Design Manual and an urban design by-law, the plinths are required to have windows for transparency and every corner plinth is equipped with high ceilings and zoned as mixed-use—this way, each corner is or could become a small café or restaurant, or remain a dwelling or office space. 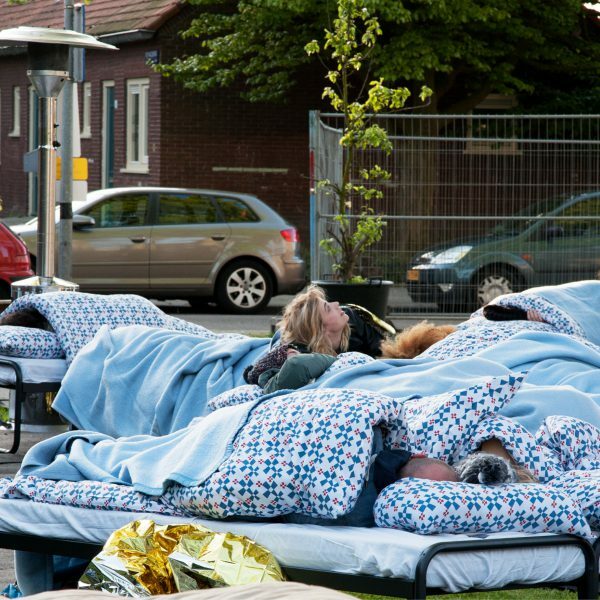 In the end, the team created an urban design that demonstrates a close knit yet urban atmosphere, promotes social cohesiveness, yet also respects privacy and family values. Exceptions to the rule. In the case of the façades and architectural diversity, rules are important, but there must be exceptions. In order to create an effective ground floor and activity-producing urban design, the exceptions to the rules were very important. It was necessary to interpret the Design Manual “with a grain of salt” in order to balance the demands of the ground level and obtain the desired results. Preserve traditions in new development. The Danish courtyard is a typical asset in any urban residential building. It can be easy to sidestep or want to change traditions for the sake of design or adventure, but this team knew from the get-go that the courtyard was staying. In this development, each courtyard is a special gathering place for the surrounding residents and families. At the moment, all of the residences in Sluseholmen are completely at capacity. Because of the unique canal and island system, each home has a view of either a canal or the harbour. Every aspect of the ground floor of the neighbourhood fits together seamlessly. 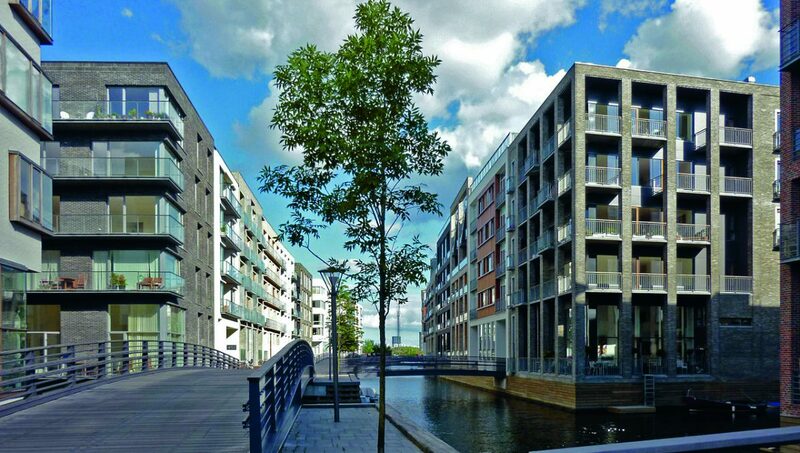 The bridges and waterways create a lively atmosphere and a distinct Copenhagen neighbourhood. 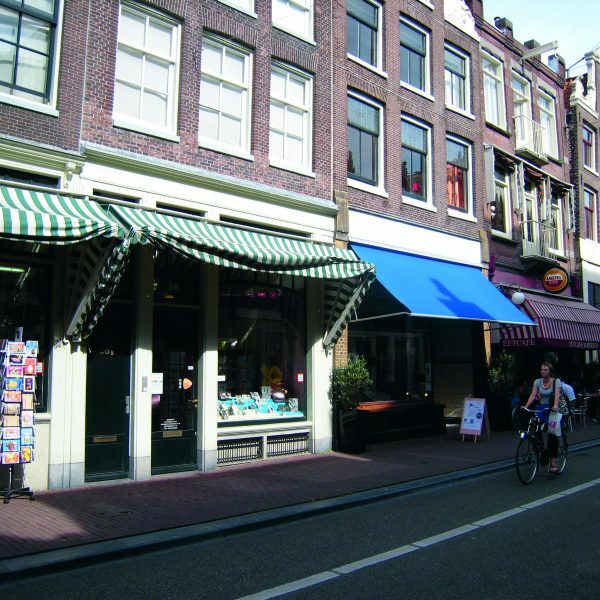 The corners of the main streets are prepared for commercial/flex-space activity with accessible entrances, high ceilings, and optional housing above. The Design Manual gave developers and architects inspiration and in the end, the façades work very well together and contribute to a sense of variety. Through enduring partnership and coordination this decade-long project was finally a success. By building consensus, writing a formal statement of project goals and objectives, and creating new devices the multiagency team tackled each challenge as it came. The site was properly mitigated of environmental damage. The canal system was soundly engineered and designed as the community’s principle gathering and interactive spaces. The Design Manual had a favourable outcome, though its interpretation still required flexibility especially to promote an active ground level and ensure a varied architectural identity. From the beginning, the team’s goal was a desire for a high quality project and to grant a high quality of life to the future residents. A main component of this was a good and successful ground floor—canal side interaction with cafés and benches. This also meant passing the by-law, requiring windows and transparency of the main street plinths and flexible, mixed-use corner lots. Multiple strategies ensured both a successful project in the present and for the future.